For the person who has everything … why not buy them a year’s membership to our Friends’ scheme? They’ll receive our newsletter, quarterly, by post and free entry to Autumn and Spring events. 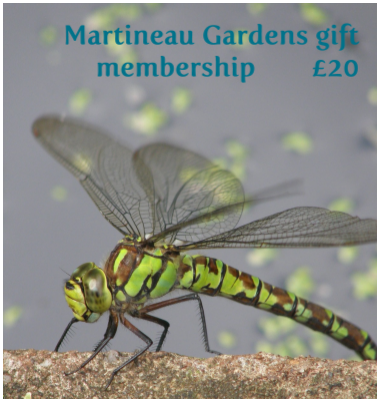 An A5 folded gift-card illustrated with images of Martineau Gardens is included for you to present, there’s an explanation of how the donation is supporting the work of Martineau Gardens and space for you to write your own message. Call 0121 440 7430 to purchase using a credit or debit card, or pop into Reception next time you visit.